New season ginger is out around Christmas/New Year in Australia and this is the time to make pickled ginger (gari). 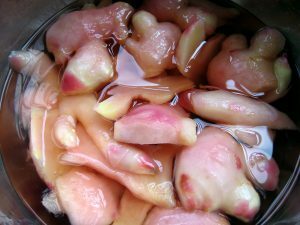 Though ginger prices have gone up, pickled ginger will keep for a long time (years in the fridge, though the colour may change) so it’s worth making your own, as the store bought always contains preservative and colouring. Clean new season ginger-you probably won’t have to peel the skin as it’s very soft, but just remove dirt. Slice or cut finely if you prefer, or into chunks like we did. Bring a big pot of water to the boil and immerse the ginger. Take one deep breath before draining the water. While still warm, place parboiled ginger into the amazu (recipe below) and leave. It will begin to turn that lovely pink colour straight away, and you can just put it in a jar and keep in the fridge. Serve with sushi as a palate cleanser, or just as a little snack, or at the end of a meal to aid digestion and warm the body. To make amazu, mix 200ml rice vinegar (always use rice vinegar, other vinegars can be too astringent), 6 tablespoons of sugar, 4 tablespoons of dashi, 1 teaspoon of salt in a saucepan and bring to boil to dissolve solids.